There are a few things that are facts… to me. Basically all available 1/12 scale dolls look terrible and aren’t poseable. Even when they are, it’s not great. Ball jointed dolls are cool… but expensive and a little weird looking. I can’t find ANY that look like an average male human. Plus, they’re WAY too big to make scenes with. There is one person out there who has solved my problem. And that person is mr_props on Shapeways. I think his work was designed with stop motion in mind, and not 1/12 scale dollhouses. Especially since, from what I can tell, 1/24 is in (smaller, more room) and 1/12 is out. On the other hand, with this doll, 1/12 is the perfect middle point to join dollhouses and ball-joined dolls into one big weird hobby that small children will love when they visit me. Now, the thing about these dolls, when compared to other dolls, is that you need to build it. This may or may not be a problem, depending on who you are. Now, here were my main worries when I bought the 1/12 scale Alter Ego (with white strong and flexible plastic). Resources are a bit difficult, so here’s another list. 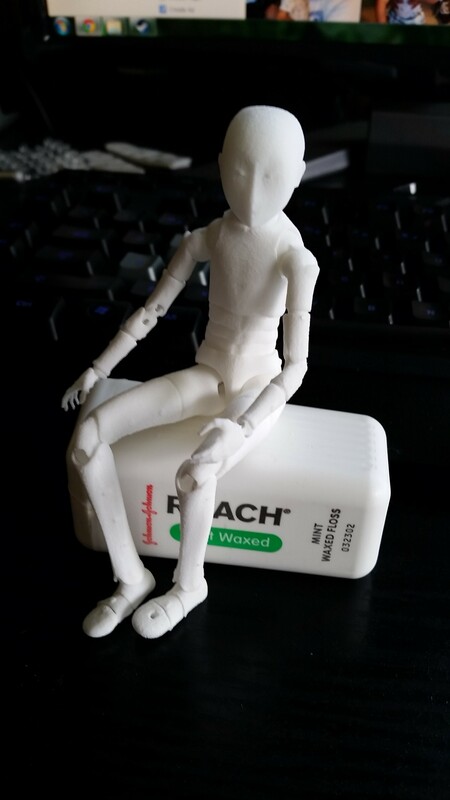 This PDF for the 1/6th scale model, which apparently has toes?? This PDF for the Frosted Ultra Detail Only, more updated version. I mostly used this, but the diagram isn’t the same. I also made a youtube video of my assembly. There was a lot I didn’t add into the video, because editing is exhausting. So here’s yet another list, this time of tips and thoughts! Why did I twist the wire together?! I can’t find any resources that suggest that. Clean out all the 3D printing dust! There’s a lot. Make sure you keep the limbs tight. It’s obvious, but not easy. Don’t cut out pieces until you need them, if you can help it. Granted, doing the sanding and painting first probably makes that a lot harder. In these cases, tape down the pieces with some wussy tape, like masking tape! Put them on paper and label the parts. Maybe write “Left arm,” put the pieces in order and circle them. Something like that. Take a break for your sanity and spine. My parents… well, my dad… have an old Greenleaf Arthur dollhouse. This picture was taken today, but this house has existed my whole life, as far as I know. Never displayed in my house (my parents’ house?) growing up. Maybe at my dad’s sister’s house? I’m not sure yet. But it’s the same house still being sold. I think it’s even the exact pre-built one they still offer, based on the colors. There’s something about this that’s really cool to me. Sure, this makes it easy: they still make the literal pieces for my dollhouse. But it’s not really that. I don’t see a lot of stuff that they still make, that was made in the 70s or 80s. I think? I wish I knew. How am I going to make it my own, knowing it’s sentimental to my dad?